Making models as part of the design development process is very important. Using an integrated approach to design, involves making models, as and when they are needed. This means making simple models, early on in the development of a product and moving on to more complex and detailed models later. Ultimately, a final realistic model of the product, is made and tested. The pages below explain model making and show variety of samples. 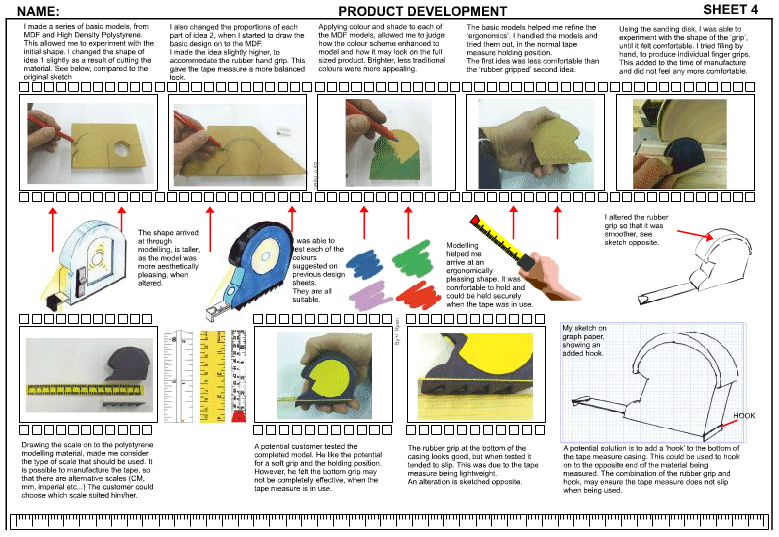 The design sheet below, explains how simple models of a tape measure have been made and tested. When developing your product consider laying out the design in a similar way. You should show how the models have been made, using photographs and text. Notes should be added, that explain how you have used / tested each model. You may include the comments of potential clients / customers. Also, add comments that clearly explain problems that the models have 'identified' and even solutions to your original designs.